The Intergovernmental Panel on Climate Change (IPCC) found, in its 5th Assessment Report (AR5), which was released in September, that the worldwide human community has a global lifetime budget of “burnable” carbon-based fuels. Beyond that, any further burning of carbon-emitting fuels would push global average temperatures more than 2°C higher than the historic norm, unleashing unmanageable climate destabilization. So, though existing reserves might allow us to use far more than the scientifically measured carbon fuel budget, those resources are in effect “unburnable”. This is not a matter for ideologically driven debate. This is a question of hard numbers. A 2°C rise is the tipping point, beyond which it is projected climate destabilization will be irreversible, with complex feedback loops exacerbating the situation more and more. Beyond a certain point, probably well before we reach the full 2°C rise, the actual cost of adapting to significant destabilization of historically consistent climate patterns will exceed our ability to spend to respond. The real choice is not between climate action or the status quo; our choice is either to plan intelligently and avert the worst impacts of climate destabilization or to simply adopt a spend-to-defend attitude to cope with ever more severe and costly impacts. Macroeconomic analysis is a way to simplify, organize and promote discussion about an ecological web of interacting human and natural systems. The more ecologically informed it is, the more precise. We can’t sweep climate costs under the rug; we pay into the climate system or we borrow against it; its stability is a resource we can deplete. Whether we should spend unprecedented sums to shore up the global climate system is hotly debated in global meetings. The more carbon-based fuels we burn, the higher the cost will be, so the argument is getting settled for us. At the COP19 meetings in Warsaw, global negotiators were unable to reach agreement on how to provide adequate funding for the climate adaptation needs already built into the world economy now. If the world as a whole passes the point where climate costs significantly outstrip our ability to fund an intelligent response, even major investors with diversified portfolios will struggle to prosper. Instability will dominate the world economy, possibly creating a vacuum of political and technological leadership, further diminishing our ability to mount an intelligent response. So, fossil fuel resources that would not be used until after we have burned through our entire carbon fuel budget are unburnable and unbankable. They pose significant risk of major financial losses to any entity that has them on the books in large volume. This is not an easy problem to solve, in part because overnight global divestment could destabilize nations and reduce the flow of capital across borders; that can have the effect of heightening tensions between governments and limiting the freedom of both individuals and of enterprise to adapt to a changing landscape. Reports from Warsaw suggest the delegates from national governments have ignored this problem. The IPCC is a UN body, so its findings should inform the discussion at the COP meetings. What’s more, the IPCC is known for its conservative climate modeling. The actual budget limit might be lower than reported. The COP process is still mired in the false logic of a struggle to determine whether or not climate action would be “worth the cost”. We now know, however, that inaction will cost far more than any action we can undertake. That is not a choice; that is the math. Global climate destabilization will cost us far more than reorganizing our societies and building more sustainable infrastructure, to avert the worst of climate change and to ready ourselves for already built-in climate impacts. We need to stop burning fossil fuels, and do so affordably. We can use carbon fee and dividend to do this. Each nation can adopt its own plan, without a global treaty. The market will work out the operating costs for each nation’s timed transition plan. Then, we need a climate impact response funding mechanism (CIRF). The Green Climate Fund, sometimes referred to as the Global Green Fund, and the Global Environment Facility, could serve this purpose; that is what much of the wrangling at the COP meetings has been about. We have a global lifetime carbon budget, set by nature and identified by science. 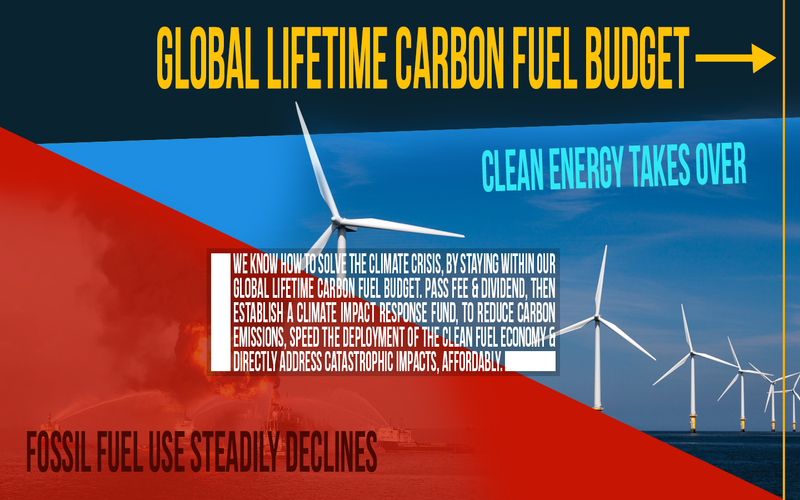 Carbon fee and dividend will allow us to affordably phase out fossil fuel use. The CIRF mechanism we eventually settle on will be more efficient after CF&D. Global negotiators, national governments, the financial sector and major energy enterprises, need to keep the carbon fuel budget at the center of their awareness and build an understanding of it into their calculations. If we have only five years to get a global transition irreversibly underway, we need to start now.